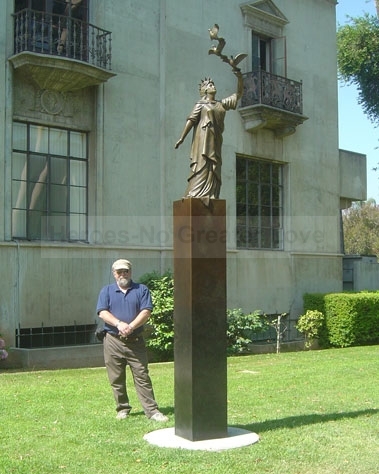 Artist Lawrence Noble from the "Noble Studio of Sculpture & Design" in Crestline, California stands with pride next his bronze statue of a lady releasing doves into the sky as a sign of freedom for the souls lost in the 911 Attacks on America. Lawrence has created other well knows bronze statues in the state of California including, "officers down" and the "Sacramento Firefighters Memorial". Presently he has been chosen to sculpt and erect a monument called "Freedoms Flame" Please check their website: Freedom's Flame - September 11th Memorial you can see more information about Freedom's Flame on the following page. A nice photo of the artist in his studio with Barbara can be found under Barbara's pictures.